This page is a companion for the SIAM Review paper on power-law distributions in empirical data, written by Aaron Clauset (me), Cosma R. Shalizi and M.E.J. Newman. This page hosts implementations of the methods we describe in the article, including several by authors other than us. Our goal is for the methods to be widely accessible to the community. Python users may want to consider the powerlaw package by Alstott et al. NOTE: we cannot provide technical support for code not written by us, and we are busy with other projects now and so may not provide support for our own code. 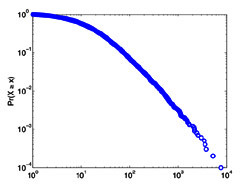 This function generates continuous values randomly distributed according to one of the five distributions discussed in the article (power law, exponential, log-normal, stretched exponential, and power law with cutoff). Usage information is included in the file; type 'help randht' at the Matlab prompt for more information. This function implements both the discrete and continuous maximum likelihood estimators for fitting the power-law distribution to data, along with the goodness-of-fit based approach to estimating the lower cutoff for the scaling region. Usage information is included in the file; type 'help plfit' at the Matlab prompt for more information. After several requests, I've written this function, which plots (on log-log axes) the empirical distribution along with the fitted power-law distribution. Usage information is included in the file; type 'help plplot' at the Matlab prompt for more information. This function implements the nonparametric approach for estimating the uncertainty in the estimated parameters for the power-law fit found by the plfit function. It too implements both continuous and discrete versions. Usage information is included in the file; type 'help plvar' at the Matlab prompt for more information. This function implements the Kolmogorov-Smirnov test (which computes a p-value for the estimated power-law fit to the data) for the power-law model. As above, it too implements both continuous and discrete versions of the test. Usage information is included in the file; type 'help plpva' at the Matlab prompt for more information. The discrete estimator needs to calculate the Hurwitz Zeta function for normalization. Matlab includes this function in the Symbolic Math Toolbox (but be warned that their implementation becomes unstable for large alpha and xmin, e.g., alpha>7 with xmin>150). There are also free versions available if you don't have this toolbox. For instance, Paul Godfrey's special functions library (via Matlab Central File Exchange) gives one, which we mirror here (note, you need both these files; tip to Will Tracy). The functions necessary to compute the log likelihood ratio tests is implemented in the statistical programming language R. Documentation of these functions is given in a separate file, and the R functions themselves are in a downloadable tgz file (note: this is not a proper R package, yet). Get the most up-to-date versions of the complete implementations. For the Matlab functions written by me (Aaron), all of them were designed to be compatible with Matlab v7. They are not necessarily compatible with older versions of Matlab. That being said, it should be possible to make them compatible as the core functionality does not depend on v7 features. The code provided here is provided as-is, with no warranty, with no guarantees of technical support or maintenance, etc. If you experience problems while using the code, please let the author(s) know via email. I am happy to host (or link to) implementations of any of these functions in other programming languages, in the interest of facilitating their more widespread use. However, I cannot provide any technical support for that code. The original pl* functions (Matlab) were written by Aaron Clauset and the LRT functions (R) were written by Cosma Shalizi; all other language implementations were written by members of the wider community. Finally, if you use our code in an academic publication, it would be courteous of you to thank me (Aaron) and Cosma in your acknowledgements for providing you with implementations of the methods. If you use the implementations by other authors, you should acknowledge them instead. The 24 data sets we studied in the paper were drawn from the literature, and the proper citations are given in the paper. You can find much more detailed information, including links to download many of the data sets, here. We do not currently have any tutorial information for installing or using these methods, beyond what we describe in the paper and what is contained in the help files that go with the Matlab and R files themselves. That being said, the InterSciWiki at UC Irvine has a good overview tutorial page that may be of some use, and Willy Lai has created a nice page, with R code, that works through several examples. 6 December 2012: added a link to the R package by Colin Gillespie. 30 November 2012: replaced plpva.r with an updated version by Neal Walfield. 2 August 2012: WARNING, the zeta function implementation used here is unstable for large alpha (>7) (thanks to David Gleich for pointing this out). If you need it for this range, consider using a better library function for the Hurwitz Zeta function. 17 January 2012: fixed a minor bug in the way plfit, plvar, plpva parse the nowarn and nosmall arguments. 24 August 2011: posted updated version of plfit.r, at the request of its author Laurent Dubroca. 4 August 2011: posted Joel Ornstein's Python ports of plfit, plvar, plpva and plplot. 8 October 2010: replaced plfit.r with new version, at request of its author Laurent Dubroca. 24 January 2010: fixed a minor bug in how plfit.m reports the log-likelihood of the fitted data, for the discrete case, after the selection of xmin is done; posted updated version of Wim Otte's code with the same fix. 27 November 2009: posted Wim Otte's C++ implementation of plfit and plvar. 1 October 2009: added the option in plfit, plvar and plpva to 'lock' xmin to a specific value (thanks to Paul Willems for the suggestion). 27 August 2009: posted Adam Ginsburg's Python implementation of plfit. 13 August 2009: created a new page with detailed information about obtaining copies of the 24 empirical data sets we studied. 12 August 2009: fixed a minor bug in the R version of plfit that would cause its results to disagree slightly with the results from the matlab version (thanks to Naoki Masuda for pointing it out). 17 March 2009: fixed a minor bug in the R version of plfit that would cause the returned KS statistic to be incorrect when xmin=1 (thanks to Jeff Stuckman for pointing it out). 7 February 2009: try-catch block in integer portion of plfit now defaults to iterative version if the try block ever fails (thanks to Rajiv Das for the suggestion). 25 April 2008: changed randht, plpva and plvar to only initialize the pseudo-random number generator on the first time they are called. 5 March 2008: in the integer routines, plfit, plvar and plpva now automatically switch to a slower but more memory efficient estimation routine when the vectorized default routine fails (e.g., Out of Memory error when max(x) is extremely large). 29 February 2008: posted Laurent Dubroca's R implementation of plfit. 17 February 2008: posted the plplot.m function for plotting the fitted power-law distributions against the empirical data. 30 January 2008: corrected typo in plpva when using hidden 'sample' option, and reordered the commands for 'limit' and 'sample' throughout (thanks to Klaas Dellschaft for suggestions). 28 September 2007: corrected typo in argument parsing for randht.m, significant efficiency improvements to xmin estimation routine in plfit.m, plpva.m and plvar.m (thanks to Jim Bagrow for suggestions). 7 September 2007: corrected interim reporting in plpva.m; changed plfit.m, plvar.m and plpva.m to reshape input vector to column format, and to prevent using continuous approximation in small-sample regime for discrete data. 25 July 2007: corrected a typo in plvar.m, typo in pareto.R, typo in log-likelihood for discrete cut-off powerlaw and fixed small bug in a plotting routine. 29 June 2007: corrected a typo in plpva.m, typo in pareto.R and updated compilation instructions in discpowerexp.R.